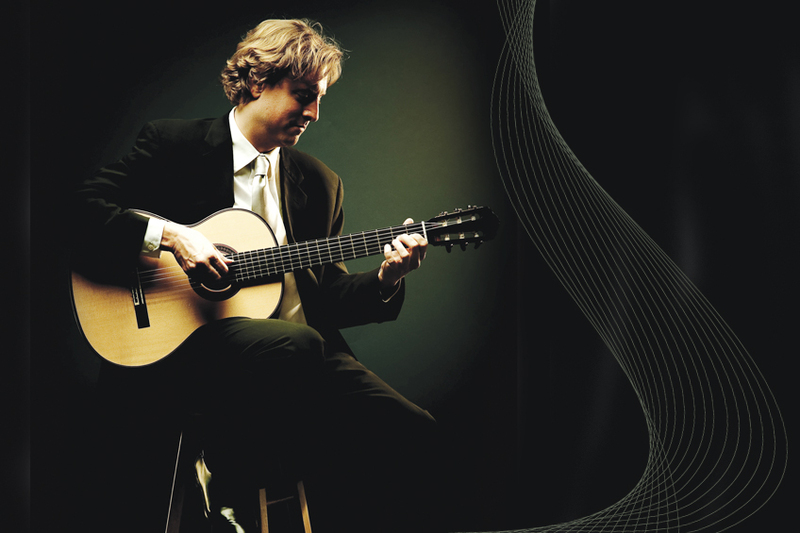 Classical Guitarist Jason Vieaux is known for his soulful performances. His latest solo album, Play, won the 2015 Grammy Award for Best Classical Instrumental Solo. Through his expressiveness and virtuosity in a wide range of music, Vieaux has made a name for himself around the world. Vieaux will make his Da Camera debut on December 9, 2016, with a musical self-portrait, a highly personal program ranging from 20th century German composer Hans Werner Henze to jazz greats Pat Metheny and Duke Ellington to the traditional guitar repertoire. Q: The guitar is an instrument whose sound decays quickly after the strings are strummed. How does that affect how you shape a musical phrase? Jason Vieaux: Not too much, you just try not to let the percussiveness of the guitar’s nature bother you too much. It helps to have a strong ear and open imagination. Q: Was the guitar the first musical instrument you played? Why were you attracted to it? Jason Vieaux: My mother bought me a guitar when I was five because I couldn’t stop listening to her Beatles records! Q: You’re a strong proponent of new music, having premiered works by Avner Dorman, Dan Visconti, Vivian Fung and Keith Fitch — among others. Why is fostering new music so important to you as an artist? Jason Vieaux: Playing new music was just something that I did in college when I was a student at the Cleveland Institute of Music. I had classmates and friends that were composers, so it just became natural to do that after a while. There’s not really a big mission to it for me, I just think that it’s good for the instrument, and it’s very enjoyable for me. It has also helped improve my technical range on the instrument over the years. Q: What do you consider your biggest accomplishment so far? Jason Vieaux: Marrying my wife, Erine, and starting a family with her. Q: We hear you have a special trick with ping pong balls and your musical instrument; how did this start? And in the case of my thumb, it’s just a professional necessity due to so many concerts and so much practicing of the seven to nine hours of repertoire every year. Q: Tell us something about your personal instrument that most people don’t know? Jason Vieaux: I play a 2013 Gernot Wagner guitar and abuse it regularly. I don’t take very good daily care of my guitar, there’s just not enough time in a day. Q: Tell us a bit about the wide range of influences that are represented in your Houston concert; why did you select them for this program? Jason Vieaux: This is a typical program for me, actually. I have always enjoyed programming a lot of different styles of music. More recently, I’m expanding that even into the realm of jazz. In the future, I would be very open to programming even some of my own compositions and certainly more of my own arrangements. My new album Infusion (Azica Records October 28, 2016) with accordionist/bandoneonist Julien Labro borders that line between classical and jazz and includes arrangements by both of us.